"Mi pedido llegó en perfecto estado y rápido muy buena la atención y la..."
Purple agate geode from Brazil. It is a geode of agate dyed purple with natural gray streaks. It is a unique piece from Brazil. 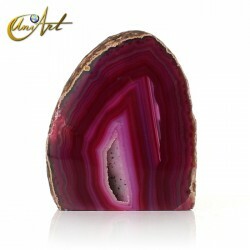 In Feng Shui it is advisable to use an agate geode to harmonize the energy of the environment. This agate geode weighs 1.370 kg and measures 10 cm x 14 cm x 7 cm approximately. UNIQUE PIECE. Agate geode with oval format. Agate geode with oval format that weighs about 1,800 kilos and measures around 14 cm high x 12 cm wide x 7 cm thick. From Brazil, this agate geode has cute veins. A true masterpiece of nature. 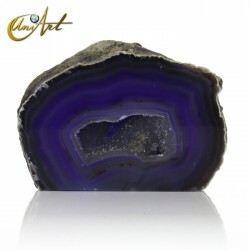 It is usually recommended using a geode of agate for harmonizing environments. UNIQUE PIECE. Agate is not really a gemstone, but rather a set of microcrystalline varieties of quartz (silica). Actually, they are varieties of chalcedony which have bands of multiple colors with little contrast. Agate can be found in volcanic rocks whose size can range from very small (only a few millimeters) to several meters. In our shop we have a large selection of agate geodes. Discover the agate as a decorative element for your home through these druses and geodes.